Batter mixes are widely used as a coating for deep-fried foods and in many other products including cakes, doughnuts, waffles, pancakes, pancake rolls, etc. When used as a coating the batter is typically applied by dipping or using an enrobing machine. Other application methods include depositing or spraying onto continuous baking drums or oven bands. Formulations vary from simple flour/water mixes to more complex recipes containing ingredients including other low-protein flours such as rice flour, oil, whole or powdered egg, milk, milk powder, whey powder, spices, herbs, emulsifiers, sweeteners and other flavorings according to the end use. Powder to liquid ratios can be as high as 60:40. The powder/liquid mixing system must be capable of rapidly incorporating large quantities of powders at high concentrations - agglomerate-free and fully hydrated. Batches must be prepared quickly to order - especially when the batter mix is used in a continuous production line. The equipment must be easy to clean. The high powder to liquid ratio makes incorporation of the powder difficult. Long processing times may be required to complete dispersion and achieve a satisfactory consistency. This could lead to overshearing some components. Some powders can tend to float on the surface or conversely sink to the bottom of the vessel and remain undispersed. The mixer must provide efficient in-tank movement to prevent this. Some powders are very cohesive and must be added at a controlled rate to reduce agglomeration of particles. Emulsifiers (where used) may require a degree of shear to obtain functionality. Cleaning of equipment can be difficult, especially more complex devices such as stirrer/scrapers and planetary mixers. Partially hydrated material can build up on the vessel wall and wetted parts of the mixer raising potential hygiene issues and raw material wastage. * See separate Application Report, Deagglomerating Batter Mixes by clicking here. 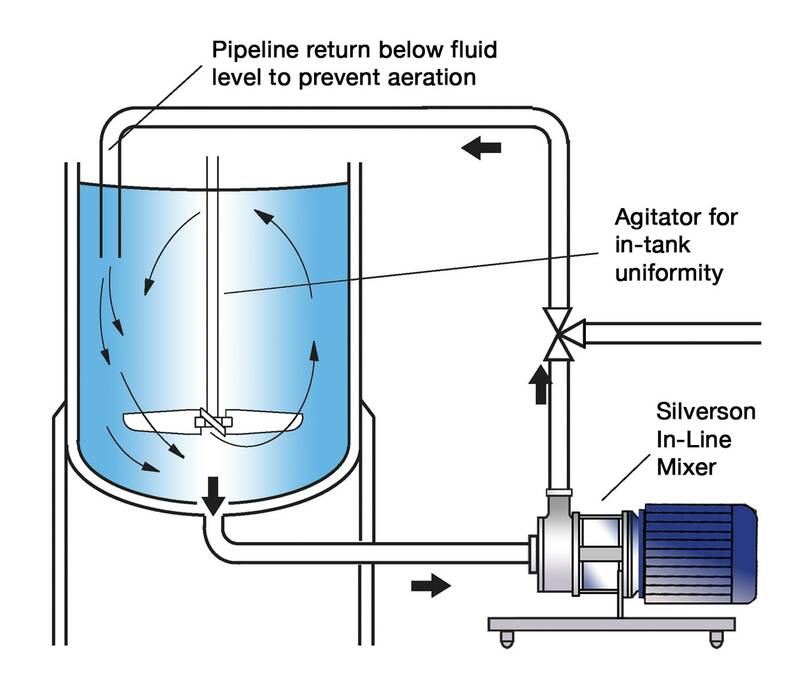 These problems can be overcome by using a Silverson Ultramix in the process vessel. This operates as described below. 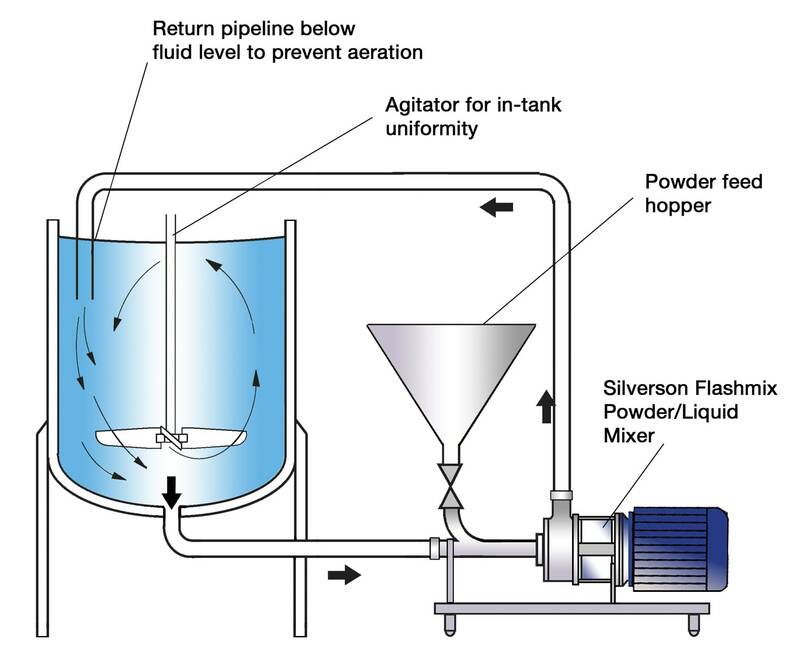 Silverson also offers rotor/stator mixers for Batch and In-Line operation and Flashmix powder/liquid systems. As the Ultramix rotates at high speed, the grooves on the outside of the dynamic mixing head project the surrounding liquid outwards with great force, creating an area of low pressure around the trailing edge of each groove. The draws the product from within the mixing head, through the radial slots to the outside, subjecting the material to a shearing action. The grooves in the head drive the product outwards into the body of the mix at high velocity. 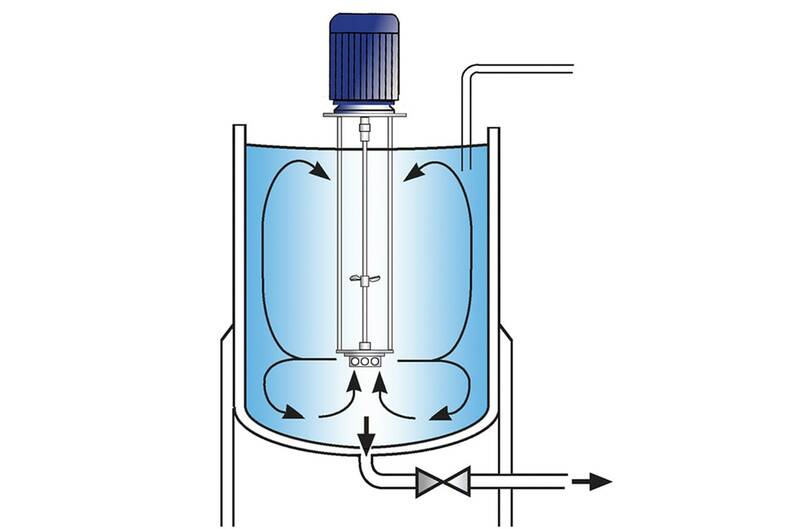 As material is drawn out of the slots, fresh material is sucked in through the holes in the top and bottom of the mixing head; this material is then drawn out through the slots and projected back into the mix. The pumping effect of the grooves and the shear action of the radial slots ensures rapid mixing and develops a vigorous axial flow pattern throughout the vessel. Excellent in-tank movement throughout the viscosity range. The high shear mixing action ensures rapid incorporation of powders and an agglomerate-free mix even at very high concentrations. Maximized yield of raw materials. The Ultramix is designed for Cleaning-In-Place (CIP) and provide one of the most hygienic methods of in-tank mixing currently available.